« Amazon Jewelry Deals Roundup All $3 Or LESS Shipped!! Have you been wanting to have some homemade ice cream? But don’t want all the mess of making it? Well I have not only a super tasty recipe for you to try, it is really easy too! 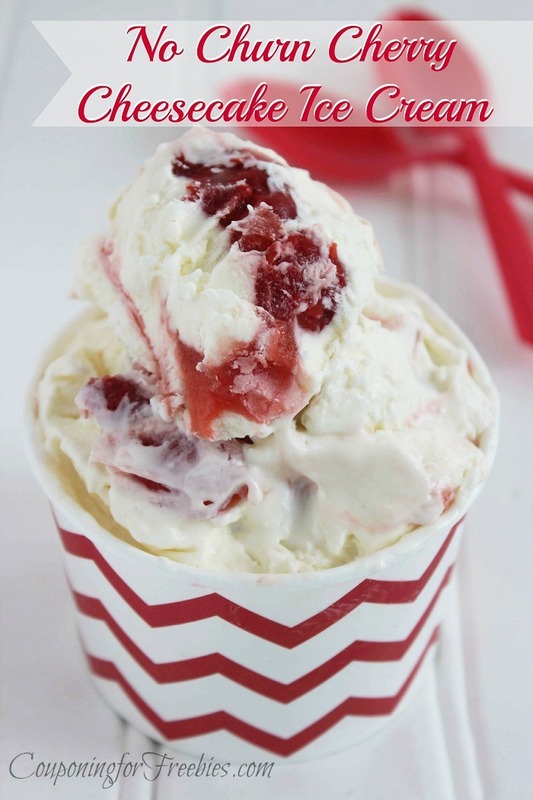 You can make this Cherry Cheesecake Ice Cream No Churn at home and you don’t even need a ice cream maker to do it! It only takes about 10 minutes to mix it all, and then about 6 hours in the freezer before it is ready. This recipe is for Cherry Cheesecake Ice Cream, but can be easily changed into other flavors as well. In a large bowl, beat cream cheese until creamy and smooth. Using a electric whisk, add condensed milk and vanilla, whisking until smooth. Add in vanilla extract and heavy cream. Whisk on high speed until soft peaks form. Spread half of this mixture into a loaf pan. Spoon cherry filling over the whipped mixture. Top with remaining cream mixture, spreading evenly. Using a knife, drag or swirl the cherry mixture into the cream mixture. Cover with foil and freeze for 6 hours or until firm.